I thought I’d share our family’s favorite way to enjoy Dr. Seuss books. Okay, technically, it’s just the baby who eats them. The rest of us eat OFF of them. 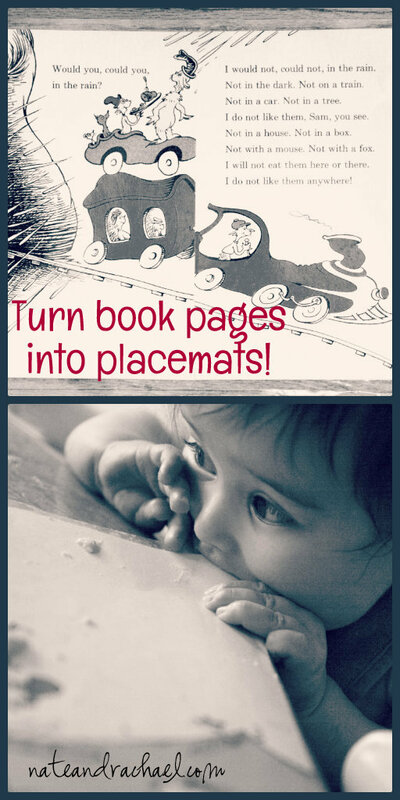 We turned an old, incomplete Seuss book into laminated placemats! I first saw the idea in Real Simple magazine, and it is, in fact, very simple. All it takes is a book, scissors, and a laminating machine. You could use self-adhesive laminating sheets or buy your own machine. I bought a brand new machine on Craigslist, and I LOVE it. But it’s been discontinued. This Scotch laminator is popular and relatively cheap. And while it looks like our baby is the only one who enjoys Seuss, let me assure you that the two-year-old is also a big fan. During meals, she is constantly asking us to read her page to her. So much so that she’s memorized her favorite page–“not in dark, not in train, not in car, not in tree.” Perhaps it’s time we dug out our complete copy of Green Eggs and Ham so that she can hear the rest of the story? How about you? What’s your favorite Dr. Seuss book or activity? While you’re here, why not like our facebook page, subscribe by email, or follow us on pinterest? We love connecting with new readers! ← Easiest and cheapest way to create and display extra-large photos– Engineering Prints!